Hurrah for Pancake Day! This year it's Tuesday 9th February, and The Book Club, at 100 Leonard St, Shoreditch, have got us covered with a special menu all day (8am-10pm) including the 5 beauties listed below, like Deep Fried Banoffee Pancakes. No booking, but I think this one is going to be popular! "Who doesn't love Pancake Day? 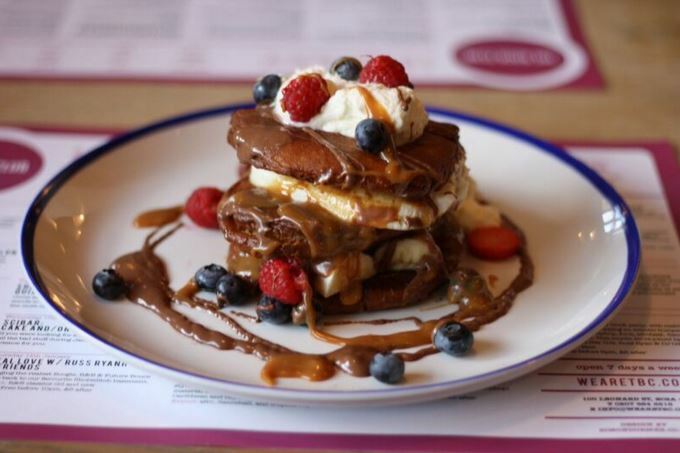 We will be hosting an all-day pancake party like no other on Shrove Tuesday (9th February 2016). We will be serving a special Pancake Day menu with indulgent options ranging from the savoury (Mexican Sweetcorn Pancakes with Chili Sauce, Bacon and Avocado) to downright sinful (Deep Fried with Salted Caramel Rum Sauce). There will of course be a gluten free healthy option for those still clinging on to the healthy-eating bandwagon. Customers will also be able to take part in a ‘Great British Flip Off’ pancake challenge during the day to see how many flips they can land in a minute. There will be an optional £1 charity donation to enter and bar tab prizes for the winners. - BUTTERMILK PANCAKES with berries, honey, citrus crème fraiche and maple syrup plus optional bacon - £5.50 / with bacon - £7.50"